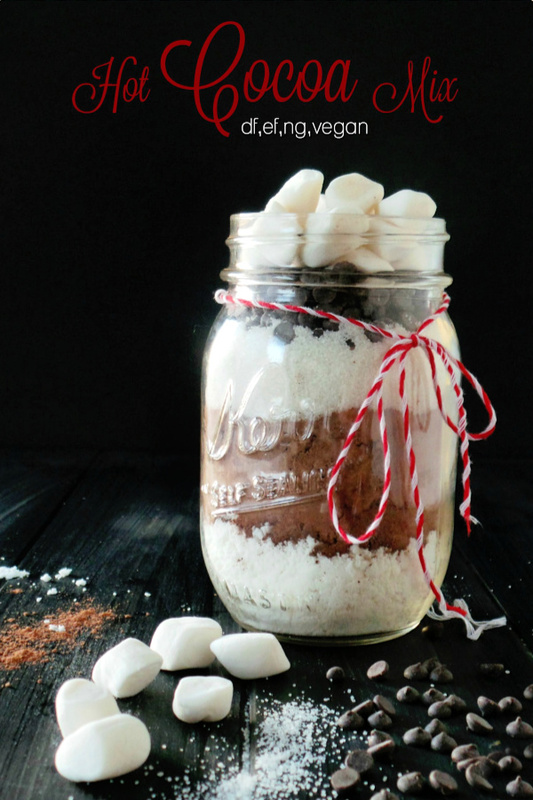 Dairy-free Hot Cocoa Jars make great Christmas gifts, and they’re thoughtful and easy to make! A delicious Foodie, teacher and neighbor gift idea! To be perfectly honest, the weather outside is B-E-A-U-tiful (60 degrees and only 5 days away from Christmas) & the Cocoa is still so delightful but this doesn’t make for a great song, does it? Regardless of the unseasonably warm weather, December holiday festivities have continued, the latest event being the showing of The Polar Express at my son’s school that included a special delivery of Hot Chocolate for their viewing. I’m pretty sure most parents wouldn’t even blink at hearing that but for us Food Allergy Mom’s, it’s a completely different story, and thankfully, my son has a teacher who called and gave me a “heads up”. 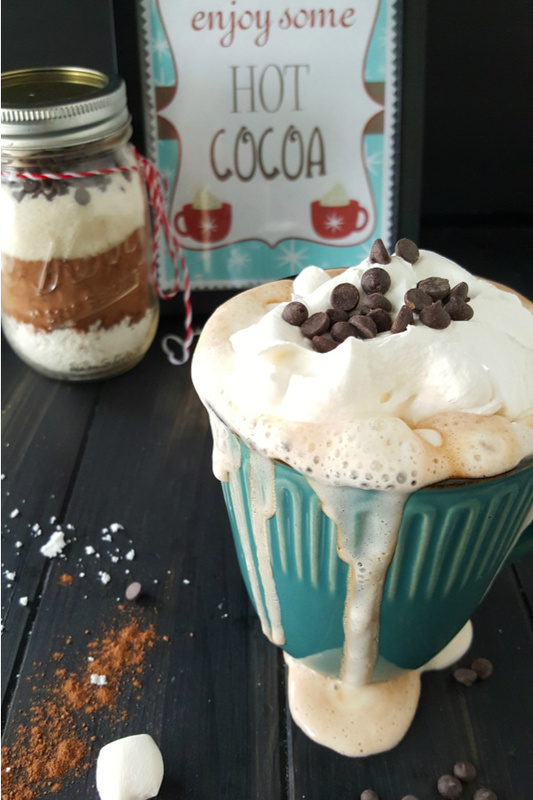 Knowing that everyone else would be drinking this warm, festive drink, I just couldn’t let my son be left out, so I went to the kitchen and worked on an Allergy-friendly Hot Cocoa that would outdo all other drinks – cuz that’s how I roll :). If it’s going to be different, it’s going to be fabulous! I started with an old recipe then worked some vegan magic. Knowing that this drink would be need to blended and mixed with Hot Water, I wanted to keep the “milky” consistency and relied on Coconut Milk powder I purchased through Thrive online. Now, if you don’t have to worry about dairy, then any type of milk powder would work, or even a Soy milk powder is available if you have a coconut allergy, BUT, I’d recommend at least trying it with Coconut milk if you can. It’s just so creamy and delicious! I then used a bakers cocoa powder and made sure to stick with a brand that was safe. 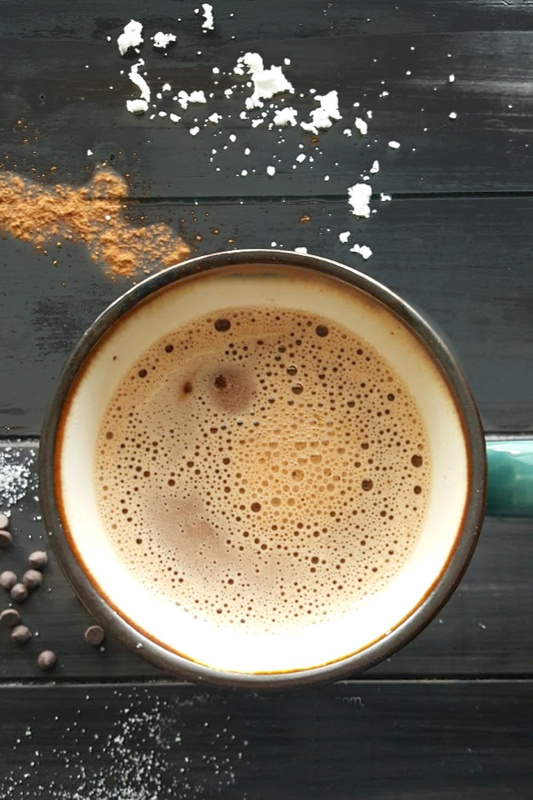 When I make this Hot Cocoa for myself, I like to use cacao powder instead to amp up the benefits, but I figured, I’ll just allow for a little cheat and let my son enjoy some good ‘ol cocoa. To offset the bitterness of the cocoa, a sweetener must be added. My “go-to ” is an organic cane sugar or coconut sugar. For this recipe, I’m sticking with a vegan cane sugar because it’s easier to find and a little easier on the wallet. Of course, you could just stop there and you’d still have yourself a wonderfully, rich and creamy hot cocoa. But remember I mentioned that it had to be fabulous? Well, this is how you take it up to that next level. Stir up your dry mixture, throw in your chocolate chips then add the water & stir. Extra chocolaty, extra rich and extra FAB! Don’t forget your marshmallows! Dandies makes these amazing Vegan & Gluten-free marshmallows which I LOVE, LOVE, LOVE! Talk about one happy child. Nothing like having your Mom visit and hand deliver an extra-large, homemade Hot Cocoa. I’ve included the single serving recipe as well as the mix recipe that will make 10 servings so you can gift it or save it for your next night of festivities. It’s dairy, egg & nut free of course and completely Gluten-free & Vegan friendly. And feel free to splurge on the toppings, like we do at home. So Delicious makes a pretty amazing Whip (think Cool whip but it’s allergy-safe), and there is always crushed candy canes, or cookie pieces, or even chocolate topping. 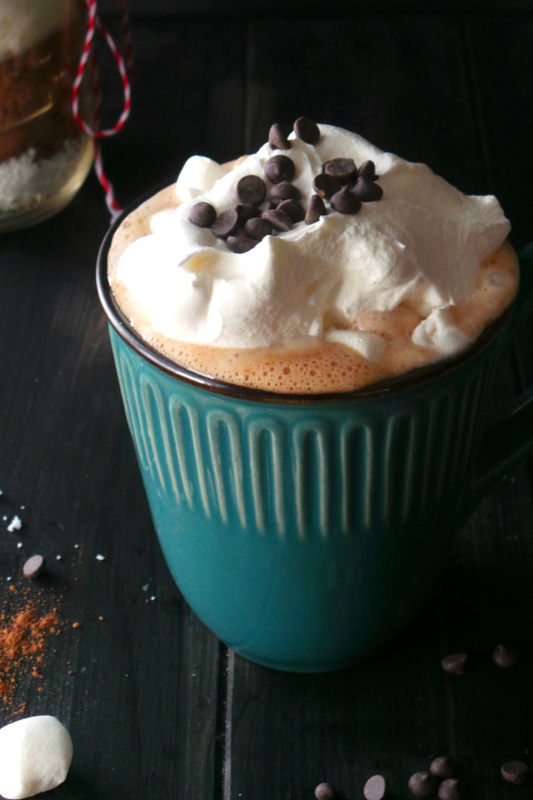 Deliciously rich & chocolaty, Hot Cocoa mix to keep you warm during the colder winter months. Free to Top 8 allergens & vegan friendly! Add coconut milk powder, baking cocoa, cane sugar and a pinch of sea salt to a large mug and whisk together, removing clumps. Add your mini chocolate chips & handful of marshmallows. Pour 8 oz. HOT water in mug and stir to blend. Add coconut milk powder, baking cocoa, cane sugar and a pinch of sea salt to a large saucepan and whisk together, removing clumps. Add your mini chocolate chips. Pour in 8 C. water in mug and stir to blend. Heat to a low boil, stir and remove from heat. 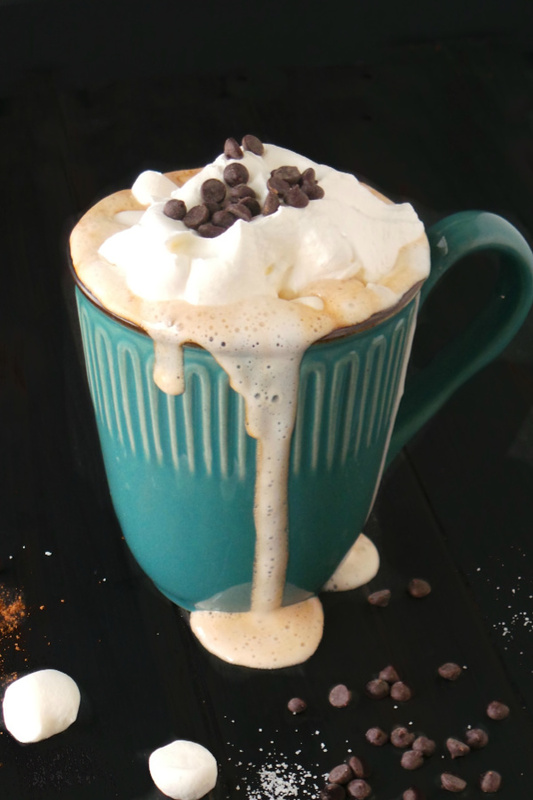 Pour into individual mugs and top with marshmallows. 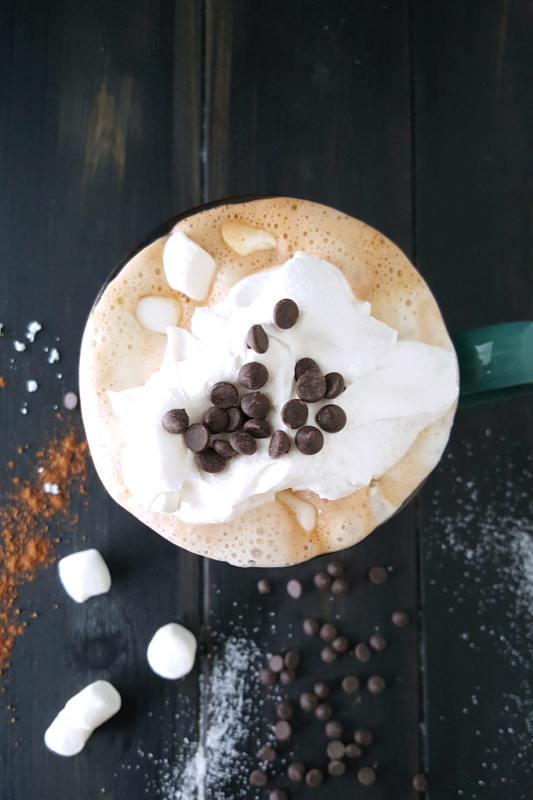 I really must try making my own hot chocolate this winter! You really should! It doesn’t take long at all & you know exactly what is in it which is a huge benefit over buying prepackaged mixes. Thank you so much for providing me with some delicious last minute gift ideas. I was even able to find some vegan marshmallows. So delicious! Thanks for sharing. So glad to hear! Did you use Dandies marshmallows? Those ones are delicious and go perfectly with hot cocoa. I just made this for myself and it’s fantastic!! I’ve been searching for a long time to find a good vegan “instant” Hot Chocolate. Thank you so much. Bridget that makes me so happy to hear! I tried so many myself before and since I couldn’t find any, this one wa created. So glad you love it.